Empathy: Are We There Yet? 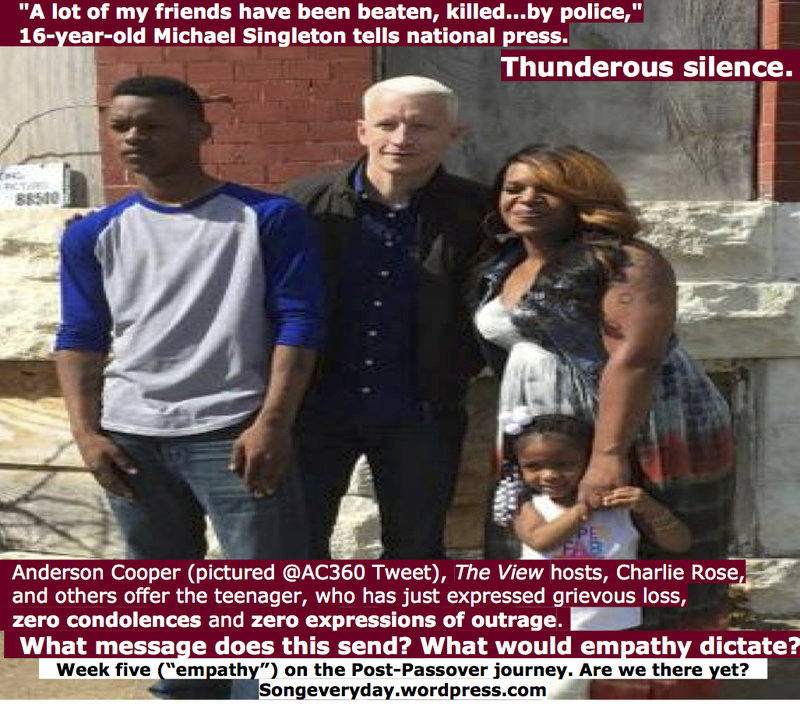 (Beyond 29) | "A Song Every Day"
Posted on May 3, 2015 by vspatz	in Community, Counting the omer, Ethics, guarding the tongue, racism and tagged #BaltimoreUprising, Anderson Cooper, Charlie Rose, counting-the-omer, Michael Singleton, omer, Toya Graham, Whoopi Goldberg. “A lot of my friends have been beaten, killed…by police,” 16-year-old Michael Singleton told Whoopi Goldberg on The View the other day. “I went down there to fight for what I stand for — my Black people.” Thunderous silence. Singleton is the young man caught on tape being slugged in the face by his mother, who was “in a rage” (her words) upon seeing that he had joined a group throwing rocks at Baltimore police after the funeral of Freddie Gray. Toya Graham was then heralded “mom of the year” by a number of media outlets, and she and Singleton were interviewed a number of times by national media in the ensuing days. Nicolle Wallace, co-host of The View, did ask Singleton if he was scared in his daily life in the neighborhood. But no one on The View offered condolences to a 16-year-old who had just expressed grievous loss. Not one second of outrage emerged as he related that agents of the state, meant to protect Singleton and his friends, hurt them instead. Charlie Rose, who also interviewed the pair, did take about six seconds to acknowledge to Singleton, “so yours was an act of protest because of what happened to your friend.” That appears to be a record degree of empathy for Singleton in the many interviews he endured with his mother. Sherill Ifill, of the NAACP, spoke on Rose’s program before Graham and Singleton, to the fearful circumstances “in which the mother found her son” and the need for systemic changes. She expressed far more compassion for beleaguered mothers of children in neighborhoods like the one Graham and Singleton inhabit. What is Applauded? and What is Ignored? Praising Graham distracts from a hard truth: It doesn’t matter how black children behave – whether they throw rocks at the police, burn a CVS, join gangs, walk home from the store with candy in their pocket, listen to rap music in a car with friends, play with a toy gun in a park, or simply make eye contact with a police officer – they risk being killed and blamed for their own deaths because black youths are rarely viewed as innocent or worthy of protection…. “What is so disturbing is that white supremacy is let off the hook,” Patton adds. Moreover: A teenager reports that his friend was beaten by police, that police abuse is a regular part of his life, and earns barely a nod. What does empathy, this week’s attribute on the omer journey, ask of us here? Thanks to Amy Brookman for sharing one of the videos above and some concerns about it. Thanks to Kay Elfant for sharing the Charlie Rose link. We counted 29 on the evening of May 2. Tonight, we count….